﻿ 1. Commonly referred to as eyeball size or eyeball length, the size of the eyeball varies from person to person and varies from age to age. Do not use absolute numbers. However, modern ophthalmic diagnostic equipment uses an eyeball size of 24mm as an absolute value that does not change with a person. All are absolute figures without variable possibilities. It is an only cornea structure that forms images on the retina without eye lens. 2. It is necessary to pay attention to <spherical eyeball>. The eyeball has a typical dichotomous form. Corneal spherical, eyeball spherical​. It is wrong expression as your eye is long or your eye is short axial length. 1. The reason why we set 6m here is because it is the distance that can make the most clear image at the farthest point with the refracting power of 58D. 1. The corneal lens sum D of the eye is not 58D. It is a contradiction of the Nobel Prize-winning in 1911 ophthalmologist Gullstrand wrongly sought eye diopter values which used in modern optics. It is the ignorance result of magnifying glass principle. Our normal eyes are 50.92 diopter => cornea 32.62 diopter + lens 18.3 diopter. Magnifying glass focal length formula: 100 / diopter = focal length, 100 / 50.92 = 1.964 cm. Therefore normal eye focal length = 1.964 cm. gnifying glass focal length formula: 100 / diopter = focal length, 100 / 50.92 = 1.964 cm. Therefore normal eye focal length = 1.964 cm. 2. On the cotrarary of normal eye external focal length of 6m one meter is the right answer. In the eyes of a human being using near 50D the correct external focal length is not more than 6m but more than 1m. The reason for this misunderstanding is that the knowledge of the magnifying glass is ignorant. A normal person is a person who does not need a minimum diopter of 0.25D. The distance beyond the glasses unit of 0.25D is the normal focus distance. The internal focal length for the light of a 0.25D convex lens is 100 / 0.25 = 4m. There is misunderstaing that internal focal length over 6m is normal distance which is not thickening the eye lens. It is related to the external focal distance outside the eye magnifying glass. But Ironically The distance between 0.25D magnifying glass internal distance of 4 meter. and external focal distance of 6meter used as the same meaning. It is the ignorance of the focal length of the inside and outside of the magnifying glass. Our eyes require a magnifying glass of 50.92D with an average adult size of 2.4cm and an internal focal length of 100 / 50.92 = 1.964cm. The images focused on retina which required 1.964cm focal length of eye magnifying lens. The images is passed through the eye magnifier (lens cornea) and the light is refracted to form the correct image at the external focal distance of 1m. When it comes within 1meter, it thickens the lens so that it focuses inside and outside the magnifier. ​ There are no notation of lens D in the eye. Even prescription glasses, measurement of ophthalmology, examination apparatus, the measuring instrument of surgery etc. It is not possible to observe the change of the lens and to measure it. As the basic cause of low eyesight, the lens, which is the center of movement and change, is missing from the measuring instrument. ​The root cause is the wrong theory of Gullstrand , the father of the modern ophthalmology. The measurement instruments of the ophthalmology that reflects the theory of "Gullstrand" all have a contradiction in measurement. To measure the refractive power of the low eyesight person theera are these diopter measuring instruments. These are not all looking into the eye. It measures the external focal distance Dioptor on the basis of normal eye and obtains needy Dioptor of external focal distance of low eyesight. The ophthalmologist does not even know that the number is in error and totally believes the figure, and prescribes it as a standard. At the level of the ophthalmologist who does not know the error of the theoretical RA (= Reflectometer) or Retinoscope dioptor there is a possibility that even if the error is reduced, overcorrection will be done without intention. On mechanical measuring statue the cornea, which is a visible magnifying glass, is easy to measure the dioptor by observing its shape easily. ​The apparatus for measuring the state of the cornea is a Keratometer. ​​However, this apparatus, even if the cornea that is visible in the eye, can not properly measure the corneal diopter, it has made an error. ​The cause is adaptation of Gullstrand's wrong theory to your eyes. It is a ridiculous instrument applied to contradictory formulas in external eye reflected phenomena. ​His theory is that if you only know the diameter of the iris, which is just glance of the eye, that is, the radius of the cornea, which is iris of 1/2, you will easy to measure the D of the cornea. It is neither more nor less. 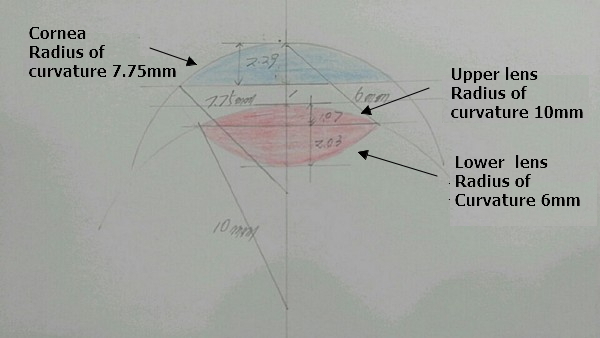 ​The radius of the cornea (the radius of the iris) is 5.5 mm. 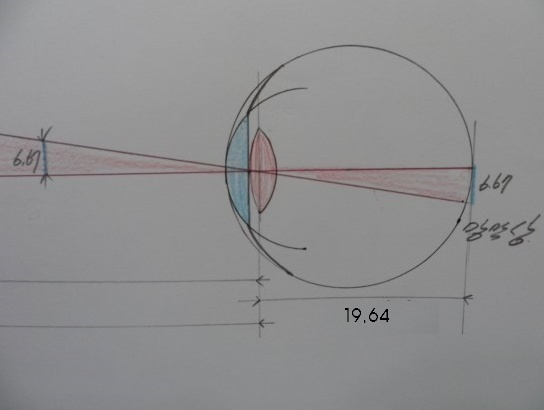 Using the Pythagorean theorem, it is easy to see that the height (thickness) of the cornea is 2.29 mm. 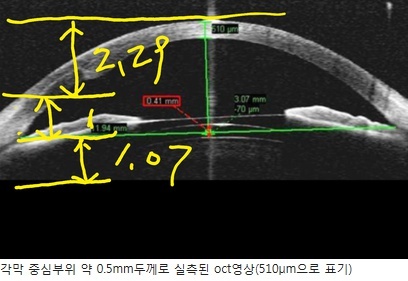 ​However, the knowledge of the ophthalmology is that the thickness of the cornea is 4 mm, and the mathematical not computed values are used. 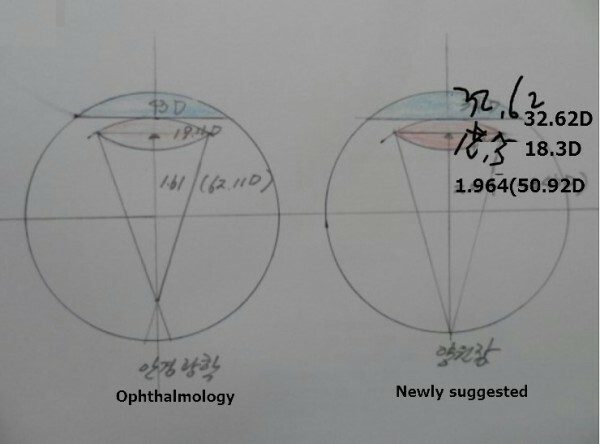 Considering the fact that the cornea is not able to grasp the contours properly in his theory, inconsistency happened subsequently between the cornea magnifier D, which is related to the focal length of the retina and eye lens​. ​The cornea D obtained by Gullstrand can be found to be inaccurate. ​Such a refraction of light is absurd. The refraction of light is not so. The Gullstrand strand fixed corneal refractive index n = 1.413 in cornea 43D. In contradictory his theory sin45 degree = 1 / root 2 = 1 / 1.414 and refraction of light is refracted at his will and calculated by sine function. 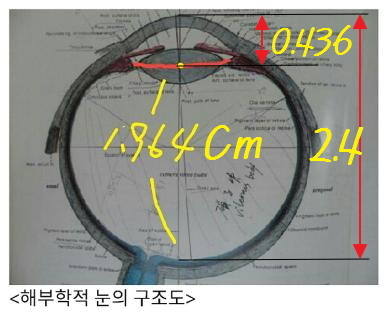 The refractive index of the cornea was taken as n = 1.413. 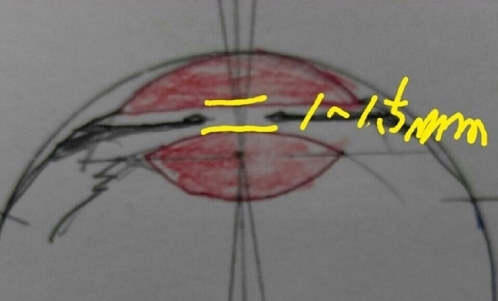 <Curvature radius = corneal radius * 1.413> formula is established. 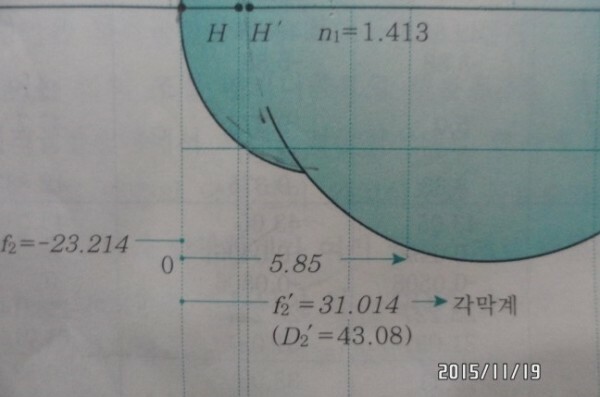 Here, the corneal radius is used to easily calculate the radius of curvature by formula substitution. apply to D = n-1 / r (m) and become D = 1000 * 0.3375 / 7.913 = 42.65D. The image that is shown to the examiner showing the enlarged image of the naked eye about 10 times using the magnifying device. If the three-dimensional curvature radius is constant, the diopter is the same at any position of the magnifying glass. ​Because mechanical measurement of ophthalmology does not have measuring instrument to look into the eye where the lens can be observed. Light penetrates the eye, allowing examiner to look at the state of the retina that is magnified by twice in the focal length of the cornea, lens synthesis magnifying glass. The thickness of the lens through which the light passes through the eye can not be seen, so we could not know its D directly. ​​Then why do I speak boldly that the ophthalmologist does not have eye lens role in eyeball. It is the knowledge content of the magnifying glass D.
D is the thickness of the magnifying glass = diopter = degree of glasses all the same meanings. D = 100 cm / focal length (cm) is used. Sum of cornea and lens diopter needed to focus on retina is 50.92D. If the cornea obtained by Gullstrand is 43diopter, what is the lens diopter? The real cornea diopter is not 43diopter obtained by Gullstrand. If the cornea is set to 43diopter, the lens can not be 50.92-43(my study values) = 7.92diopter in common sense. Under the magnifying glass D of the cornea and lens obtained by Gullstrand the cornea is 43D and the lens is 20.533D. 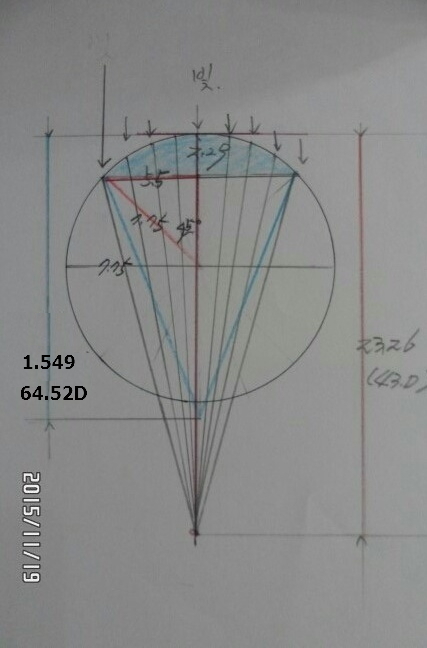 The sum of the two is 63.533D, which is 100 / 63.533 = 1.573Cm, which is not a structure with a focal length of 1.964 cm. It is put in front of 0.391cm ahead of it, and it throws out the error of 63.533-50.92 (the values from my study) = 12.61D. When it is applied to the eye, it focuses on the 0.391cm in front of the retina and becomes -12.61D, and becomes the high near-sight eye. For glasses: -22D, for contact lenses: -17D, could be worse in my study but it's already -12.61D. To eliminate this contradiction in the nineteenth century, opticianry scholar Gullstrand was unable to boldly discard his endeavored cornea and lens values D (which he adhered for the good results of honor with bad data) when he put the annoying lens D in the eye he intentionally missed it. Finally he made the corneal lens magnifying glasses structure which the only reach to the retina in our eye. (This is called deceitful academic falsity covering the truth) As a result of that manipulation the cornea was completed with an eye system with an image of 43.2diopter and a focal length of 2.326 cm. However, since the lens D has been marked, it maintains its position as a vestigial organ without any role. Through the combination of tremendous computational mistakes and contradictory light refractions the lens role disappeared at all. The cornea diopter was made with a structure similar to the manipulated formula, with the cornea forming the images on the retina. And in accordance with that theory we invented the machines and until today those machines are used as a measuring instrument. It is a mechanical measuring instrument used by modern ophthalmologists and surgical methods. Therefore the measured D is inevitably inaccurate. There are possibilities of producing overcorrection diopter prescription for D glasses or surgical error of overcorrection. Why does optometry make a false claim that the cornea is 43 diopter?